It’s no secret that radiology practices are finding new and creative ways to improve efficiency and profitability in today’s economic environment. Although reduced reimbursements and rising costs have a tight grip on every radiology practice, smart practices are examining and engineering every step of their workflow to bring about more streamlined processes and increased workflow automation. Is Your Practice Challenged by Disparate Workflows? One would be hard-pressed to find a radiology practice that is not experiencing the burden of disparate RIS, PACS and billing systems. Stand-alone systems are not designed to completely automate your practice’s workflow. What may work well for one department may duplicate efforts for another. Essentially, your workflow is working against efficiency and profitability instead of towards it. Point in Case: For the radiology practice utilizing disparate systems, the scheduler must open multiple applications, such as RIS and billing systems, toggle back and forth to verify eligibility, review outstanding balances and schedule patients. Patient records are handled in multiple systems which increases the risk of errors, affects everyone’s efficiency and decreases the practice’s profitability. 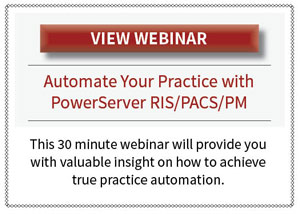 True practice automation can only be realized when RIS, PACS and billing functionality is contained in a system built on a single database and accessed through a single sign-on. Finding a system that includes the necessary features and functionality to help your site achieve complete practice automation is essential, but first, it’s important to know where your inefficiencies lie. Ask yourself hard questions about the current state of your business. Can you identify areas where improvements will affect your overall productivity? Knowing where your inefficiencies lie and understanding your goals will help you identify your requirements for a new, fully-automated system. Include your department managers in the decision because they have a vested interest in how the new system will affect their departments’ processes and productivity. An investment in a system that includes strong features for your entire user group can make an immediate impact on your practice. The biggest factor holding practices back from investing in the proper technology to automate their practice is the almighty dollar. When economic conditions get tight, the natural move is to reduce spending or interface existing systems. Unfortunately, interfacing disparate systems is not easy due to the inherent differences between software applications as well as challenges with data synchronization. This makes common tasks more complicated and time consuming. To achieve real ROI and profitability, radiology practices will need to invest in technology that will make them efficient. Smart practices that choose automation decrease their labor costs and increase revenue, improve turnaround times and increase referrals. Without critical improvements to efficiency, radiology practices will find it harder to keep their doors open and continue providing quality patient care.